Andaman & Nicobar - Port Blair - Ghumakkar - Inspiring travel experiences. Andaman & Nicobar Islands is a group of over 572 Islands, 36 of which are inhabited. They are nearer to Myanmar, Indonesia and Thailand than to the Indian mainland. Andaman group is separated from Nicobar by 10 degree channel. Tourists are allowed only in Andaman group of islands and not on Nicobar islands. 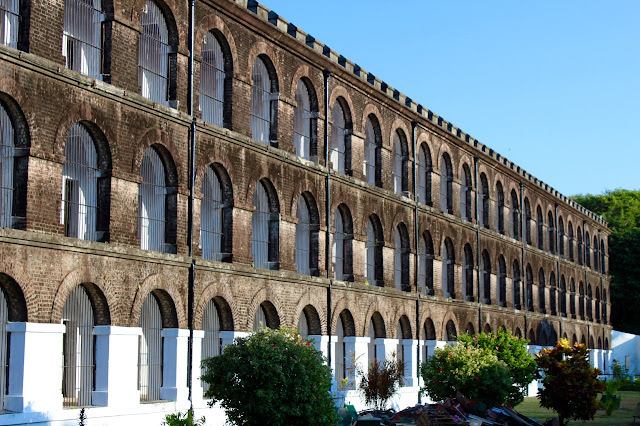 Andaman & Nicobar is famous for Cellular jail also known as Kalapani. It was the only Indian territory occupied by Japanese forces for 3 years from 1942 to 1945. Andaman & Nicobar faced fury of nature in the form of Tsunami in 2004. Andaman has people from many ethnic origins due to the way it has been seen the influx of people over last couple of centuries and is now a pluralistic society. Andaman & Nicobar is place which has been in our conscience as one of the two island clusters in India apart from Lakshadweep. I am sure through our growing up Indian students have heard about Andaman & Nicobar several times in Geography class due to its distinctive location and in History due to part it played in India’s freedom struggle. 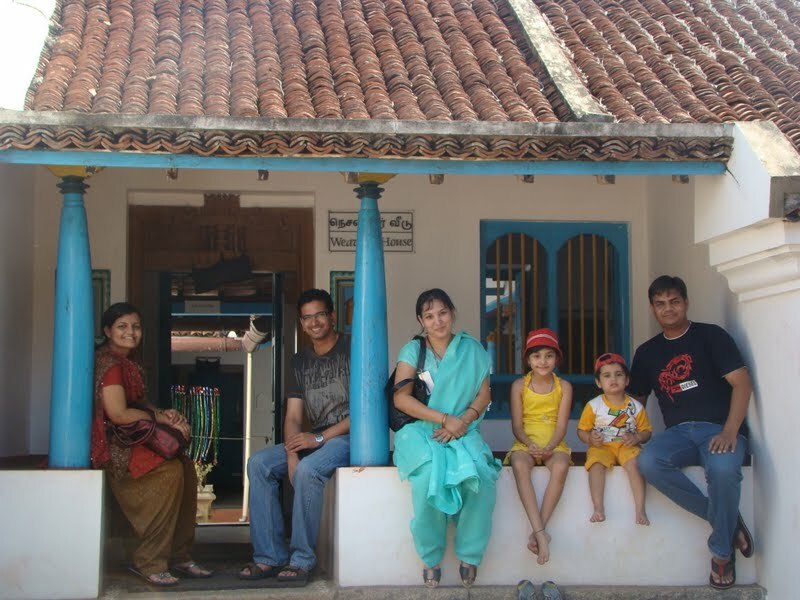 For me, I heard about it even more as my parents have lived in Andamans. My father was posted there due to his Central govt job. I was fascinated by stories of how they would sail from Kolkata arriving at least two days earlier in city to report for the sailing ship and then spend three days at sea. My father has rare distinction of not just living in Andamans but even Nicobar. He was posted in Great Nicobar for almost an year which is still out of bounds even for Indians. He even flew once from Port Blair to Kolkata via Rangoon. This used to be one boasting point about exploits of our parents in childhood. Here’s a map of Andaman & Nicobar. Being a traveller myself, Andamans was always on the list of places to be visited. The opportunity finally came when my brother-in-law who is in Army got posted to Port Blair. We immediately made plans to visit Andamans in January 2016. Even though going to Andamans would be fascinating by ship but it consumes three days and with wife & kid it may not be a great idea due to us land dwellers. So, we booked air tickets much in advance. Route was Pune – Chennai – Port Blair with long layover in Chennai to & fro. Due to limited flights to Andamans, the tickets prices are comparable with going to let’s sayThailand and many people opt for South East Asian countries than Andamans as those are much more developed and attractive for leisure tourists. However, there is no dearth of tourism in Andaman due to first of course it being exotic destination but also due to the fact that Andaman is most distant destination in India to avail 4 year LTC allowance that government servants get. So, its a LTC tourist destination! Most of the planning with local tour operator and arrangements were carried out by my sister so it was a relief. We had total nine days which we wanted to utilized to the fullest and my god we did! We left Pune by Indigo with a late night flight for an early morning departure from Chennai to Port Blair. We reached Chennai by 12 midnight. There are Retiring Rooms available in Chennai airport and is easily given to people traveling to Port Blair on connecting flights. Thankfully, it was available (Rs. 1500/night) and we had a little rest. The Air India flight was at 5:50AM and we were in Port Blair by 8AM. Most of the time flight was above clouds but on descent everyone started looking out for islands and there were some visible through the haze. We went straight to our guest house in A&N command campus. After lunch at my sister’s place, we went for first tour of the trip. 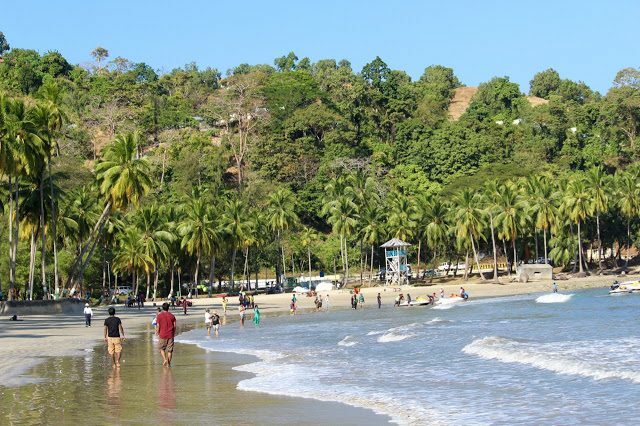 We first went to Corbyn’s cove which is a beautiful crescent shaped beach within Port Blair. The water was clean and blue and light perfect to try my photography with newly purchased DSLR. The beach was well maintained with a promenade high above water line with benches, a lifeguard tower and a restaurant. 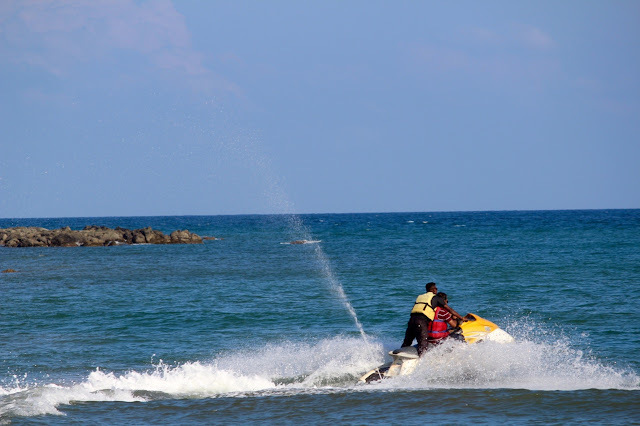 There were some water sports facilities like scooter which I tried. There is a small rocky island a little inside the water which our driver told is frequented by sea snakes so it is also called as Snake island. 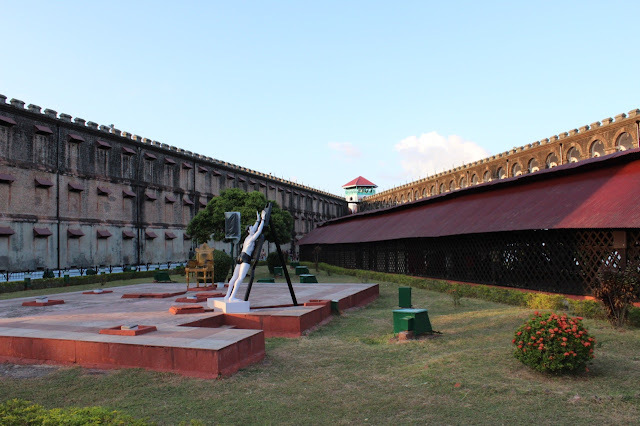 From there we went to most prominent attraction of the island which is Cellular jail. The road from Corbyn’s to Cellular jail hugs the coast and gives magnificent views of the sea. I am sure every Indian must have heard of Cellular jail or Kala Pani as it is known in folklore where hardened freedom fighters were sent for life sentence to keep them away from mainland. It is an epitome of atrocities carried out by British on Indian freedom fighters. Its most famous occupant was Veer Savarkar who spent around 10 years in the jail. The airport at Port Blair is named after him. 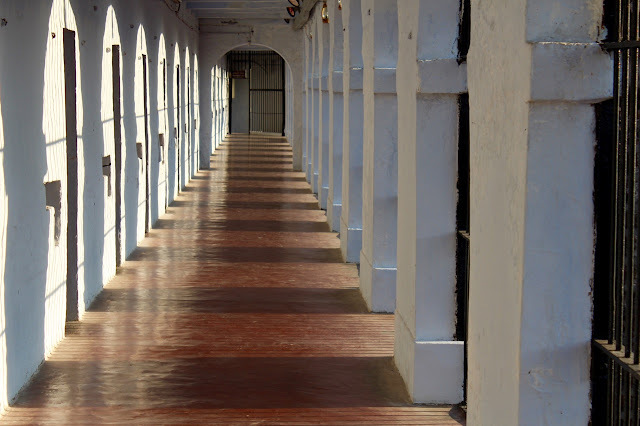 The history of Cellular jail is well documented so would not go into that. What remains of the jail are three wings, others are destroyed. They all radiate from a central tower which is still there. Walking in the corridors is a reminder of what hopeless situation the interns must have faced. 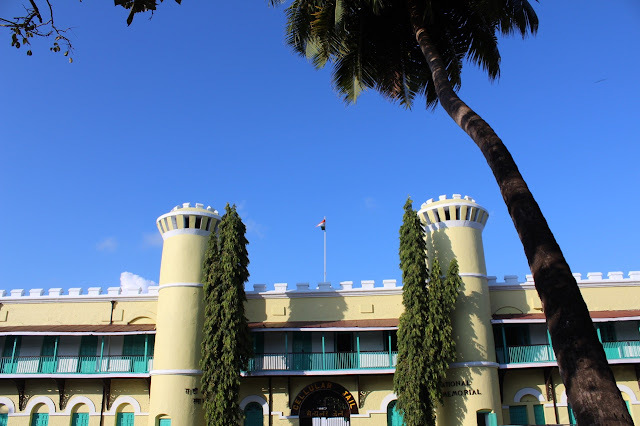 Cramped quarters with very little ventilation, not able to watch other prisoners, hot & humid weather of Andaman and back breaking work of grinding coconut oil, punishments and gallows which are just beside the building. There are models displayed of all the punishments meted out to interns inside the jail. The light & sound show in the evening which starts only around sunset presents the history of the jail quite well. The iconic image of this show is lighting of three-storied barracks of the building in tri-color. Veer Savarkar’s cell is prominently marked situated at the end of corridor with his photo and utensils that he used still preserved. We climbed the tower and walked on the terrace of the building for panoramic view of city and sea around. 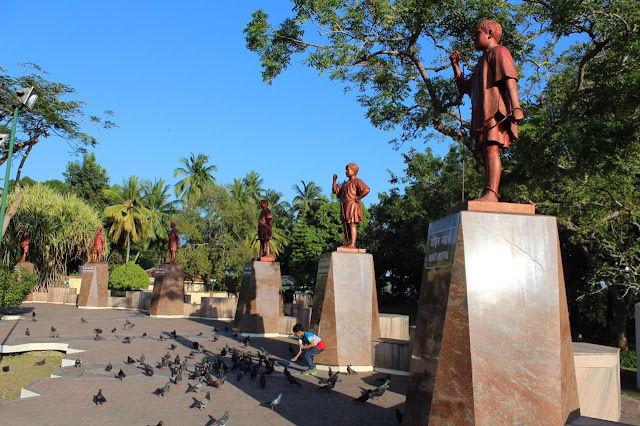 In front of Cellular jail is Freedom park which has statues of famous inmates of the jail including Veer Savarkar. Here we were joined by my sister’s family. We first went to the market, collected some refreshments and went to the Marina for a walk in the evening cool breeze. 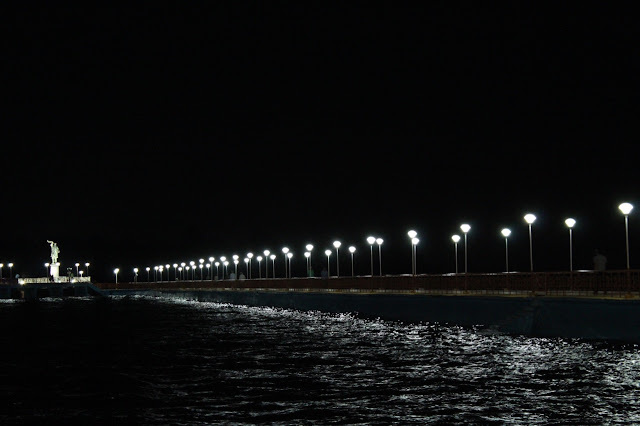 The marina is very well developed with promenades over water and lighted by white lamps which is a sight to behold in the dark night. 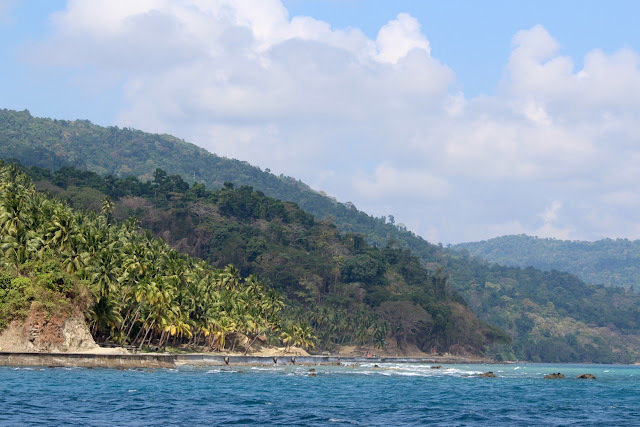 Today we went to what is known as Three Island tour which includes Ross island, Viper island and North Bay which is actually tip of the bay which comes quite a distance inside and around which Port Blair and other small habitations are located. North Bay has the lighthouse which is depicted at the back of Rs 20 note. This is a fact which you will hear many times during the visit. Viper island was out of bounds for at this time by authorities so we could not visit it. It is a small island famous for chain-gangs (prisoners tied together in chains) and for gallows in a small dome topped building. My parents have a small, old, black & white picture of having picnic on this island. Now I could relate to where it was. The ferry starts from Junglighat jetty which is a little inside the bay and sails its way around Port Blair to come to North Bay giving ample views of activities happening around. There were vessels of Coast Guard & Navy to look at, Viper & Chatham islands, jetty with docked ships and criss-crossing boats. This reminded me of bay around Fort Kochi which is equally busy. It is mandatory to wear life-jackets in the boat and observed through the tour that safety standards were being followed. There was an accident in 2014 after which it has been made stricter. After an hour, we landed at North Bay beach. 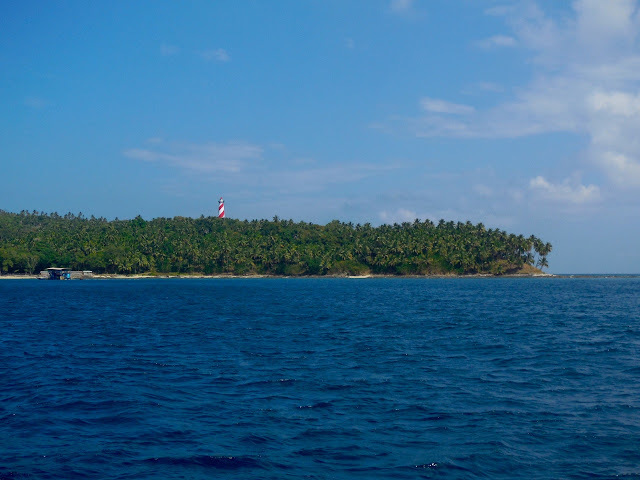 Ross Island has illustrious history and interesting geography. 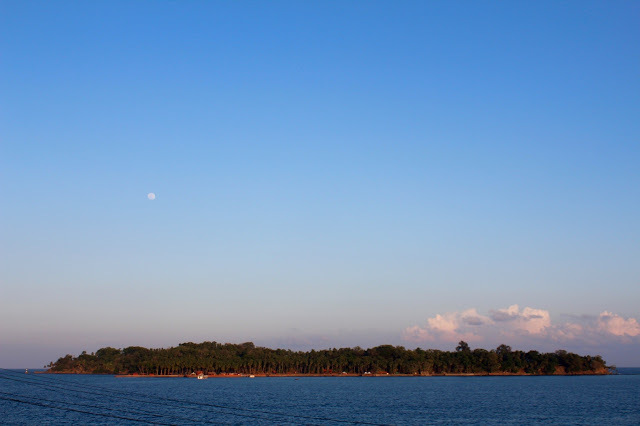 It is within swimmable distance from main Port Blair. It was headquarters & residential colony of British government at the beginning of their occupation in Andamans. The island was built up in British-style with all the amenities like resident quarters, tennis-court, swimming pool, market and even a bakery. After British moved to main Port Blair, the islands flora & fauna grew to overtake the built up structures. 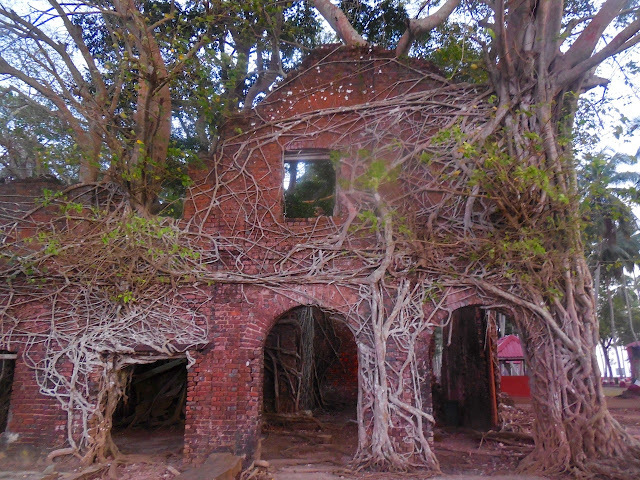 Now we see all those structures turned to ruins grown over by banyan trees and lots of fauna like deer, rabbits, peacocks who live and freely roam around on the island not deterred by humans visiting them. 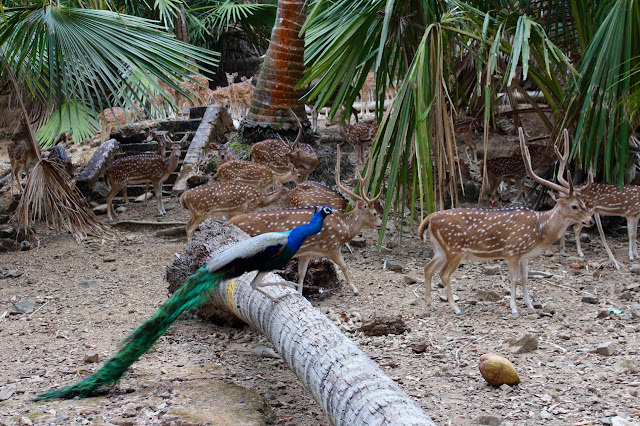 The tourists who come to Ross freely interacted with the deers and peacocks here. 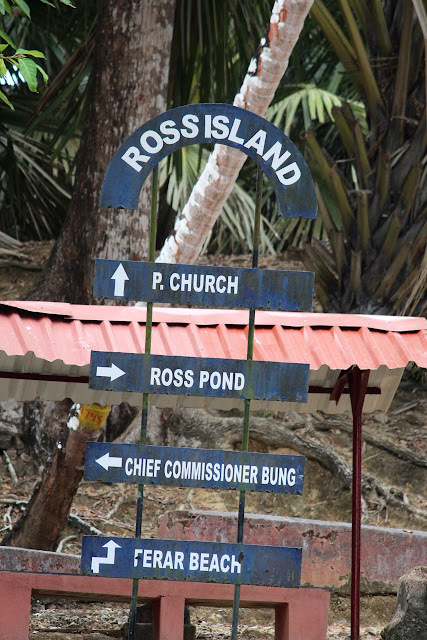 Ross island is open only for day travel and in the evening entire staff also returns back to Port Blair. We had a quick walk around the island but not enough to explore it fully.It has three water sports option – glass bottom boat, scuba diving and under sea-walk. North bay has good amount of coral reef under its waters. We first went in glass bottom boat which was glimpse of coral life. We could spot few corals and some fishes but nothing great in my personal opinion. The glass bottom is not for the full bottom but only a limited length with not very clear glass and one has to bend a lot to look and keep shade by holding a cover which was not very comfortable. We came to the shore and decided to go for under sea walk as we had planned to do scuba diving later in the trip. The under sea-walk was decent around 15 minutes inside, 20-feet deep, spotting some colorful fishes and mandatory photos. We had quick lunch at one of the shacks there. From there we went to Ross Island and did not expect what was in store. The under-sea walk was provided by Sea Link adventures. After coming back from trip we found that the CD given to us did not have our photos but on sending them the details they promptly emailed the photos to us. We would later return to it for Light & Sound show about which a little later. Ross island is now maintained by Navy and is a charming, rich historical place. In the evening we went to an annual recreational event of the defences forces stationed there. 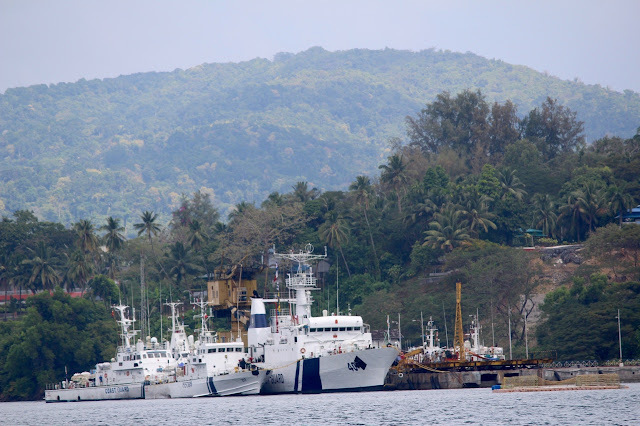 Andaman & Nicobar is the only place in India where Army, Navy, Air Force & Coast Guard is under joint command headed by a Naval person known as A&N command. The command is becoming strategic due to its proximity to Malacca strait which is one of the busy shipping route. What can one say about this brilliantly written post. All through it looked like that I was a apart of the entourage. Under- sea walk must have been quite an adventure. The pictures are totally scintillating. In one liner the post is simply superb. Roopesh, your posts have always been fascinating. You have given a very nice historical description of Andman. Natural beauty described by means of your writing and variety of pictures is superb. Really heart touching. Thanks. Thanks Sir for your comments.! Beautifully narrated with fascinating pics. If I write more, I would be repeating myself. So after purchasing we entered inside the DakshinaChitra.On our left there were shops selling crafts item .Also at the entrance we found Jagannath Puri’s idols was kept in the courtyard area. We were then informed by the staff there that they were celebrating Orissa craft festival so craftsman’s from Orissa has come here to exhibit their art and culture.